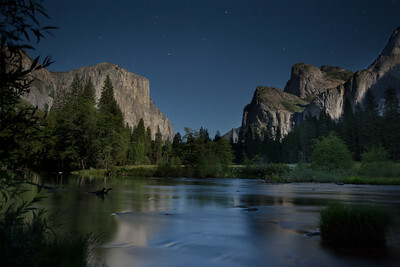 I love visiting Yosemite National Park, especially at night. All of the crowds are gone giving us the opportunity to enjoy the park as few do. 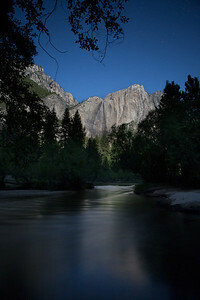 Yosemite Valley traffic by the light of the full moon. 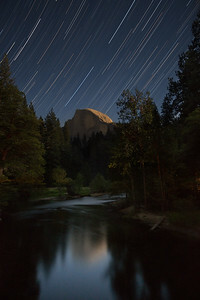 This was taken during the new moon and the Perseid Meteor showers from an area that overlooks Yosemite Valley. 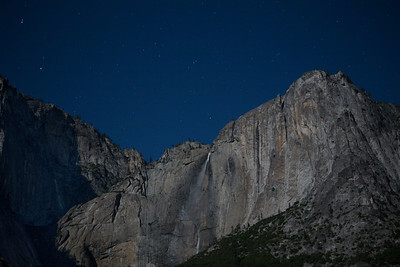 Upper Yosemite Falls as seen from Cook Meadow at approximately 2am during the June Supermoon 2014. 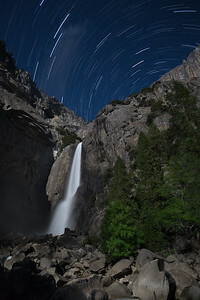 Upper & Lower Yosemite Falls and Star trails approximately 2-3am, May 2015 during the full moon. 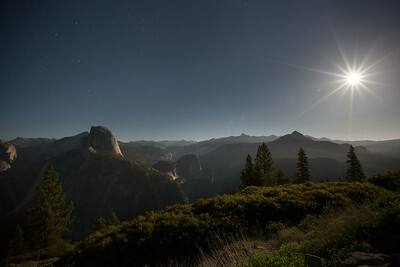 Taken during the rise of the June 2014 Supermoon. 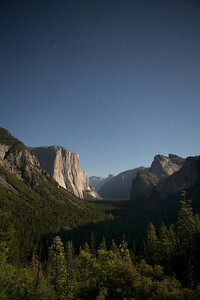 The moon lit up the entire Yosemite Valley! 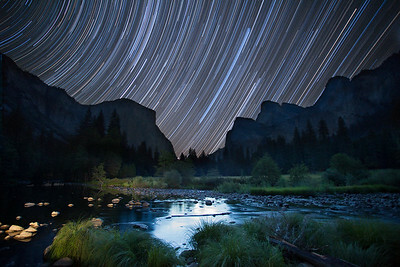 This was taken during the 2013 Perseid Meteor shower. 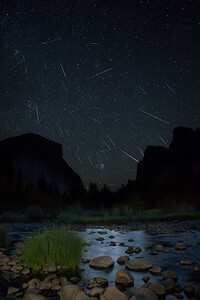 This is a combination of all photographs in which I was able to see a meteor. It was an amazing night, one I'll not quickly forget. It was simply incredible to have this iconic location to ourselves for 5 hours during the peak of the Perseid meteor showers. I loved the peacefulness of the little private beach I shot this photo from around 1am during the June 2014 super moon. I would have loved to curl up here all night and watch the world go by, but there were so many other shooting locations calling my name! 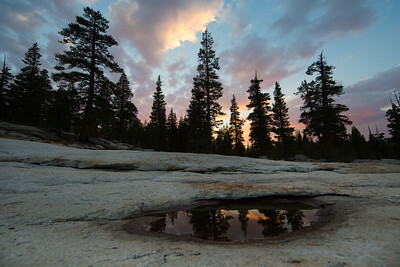 Another view from a favorite shooting location. It seems every time I come to the park, I revisit this location and see something slightly different but equally wonderful each time. This is another from the June 2014 super moon. Fortunately, I had enough time to get out of the way of the driver coming towards me. 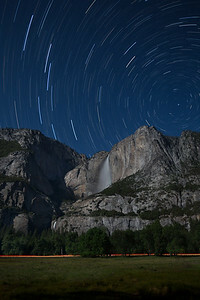 Taken at the "Tunnel View" overlook. 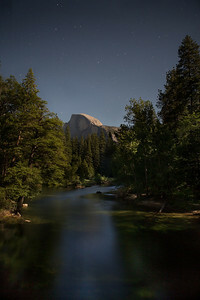 This was taken around midnight during a full moon in 2014. The camera picks up so much information it looks like it was daytime. Stay tuned for (hopefully) another photo from this location coming to the website sometime in the summer of 2015. 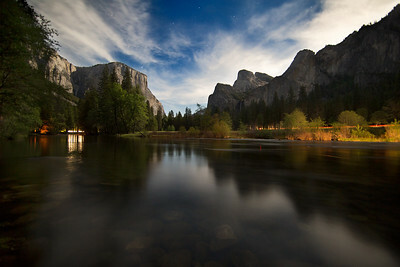 I hope to shoot from this location during a full moon and clear skies. I tried in May but it was totally cloudy. 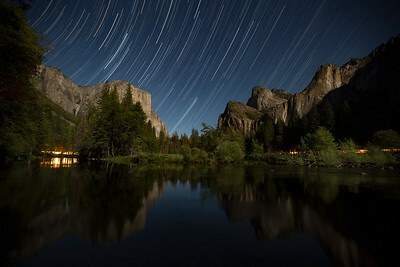 Stars, Half Dome, the Merced River, a clear night... what more could one ask for? A portrait of Brent (my husband and photography partner) admiring the spread of the Milky Way over Gaylor Lakes in Yosemite National Park. I will never forget this night for 2 reasons. 1) I saw the most massive shooting star I've ever seen (of course my camera was facing the wrong direction at the time), 2) the epic hike out in the dark. No overnight camping is permitted in this area and, while the hike out was not quite e-ticket material, it did make for some interesting stories. Here's the intrepid adventurer (aka Brent) in action. We have played around with creating "planets" from some of our photos. 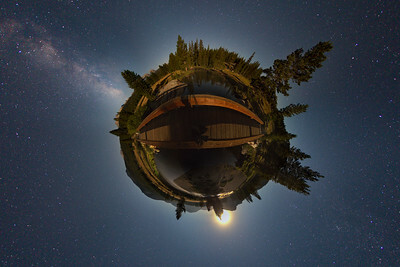 I figured taking multiple shots of him hiking up and down the trail to Gaylor Lakes might make an interesting "planet", and, if not, at least it might make an interesting 360* panorama. I think it worked in both cases. See next photo for Brent's planet. Shortly before I made this photo we met up with Kristen who writes an awesome travel adventure blog. Check out her website at: http://bearfoottheory.com. You never know who you'll meet on the trail! Poor guy, I always seem to have him going in circles. At least this time it was fun! I was lucky to get this photo. 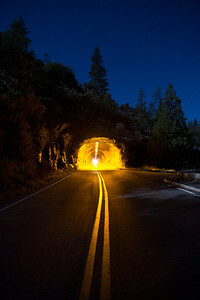 I did not realize that Tioga Pass was going to be closed at the entrance to Yosemite National Park until a Caltrans worker stopped me and told me that the park was closing at 8pm due to a coming storm. I set a land-speed record in driving my MINI Cooper up Tioga Pass and made it with 10 minutes to spare (now mind you, by normal calculations I should have arrived after 8pm). I was the last car through the park that night. 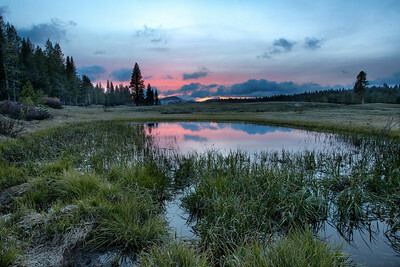 I simply could not resist stopping at this pond in Tuolumne meadows as the sunset was hitting it's peak. I got out, made my way to the little pond, got the shot and was back in my car within 2 minutes. Brent will tell you that this is a record for me!